An all-around great probiotic product, this is a supplement that works well for anyone with minor digestion problems or an interest in improving and maintaining gut health. 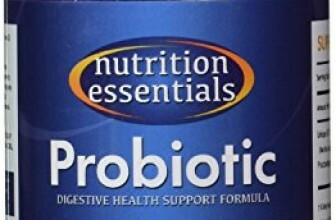 NOW Foods makes an excellent probiotic supplement without making too much fuss. 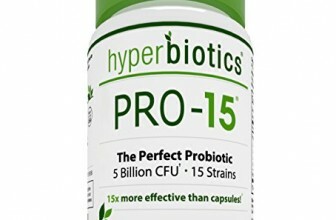 Their 10-15 Billion Probiotic supplement contains a diverse selection of probiotic strains, is packaged to ensure potency, and has long shelf-life with an outstanding number of viable bacteria throughout its expiration date. Packaged in a dark, light-resistant container and available in 50-count bottles, this is a pretty standard probiotic supplement. The capsules are not enteric-coated so some have trouble swallowing, especially considering the tablet is the size of a regular capsule. As far as function however, this is one of the top-performing probiotic supplements on the market and has long-lasting potency. 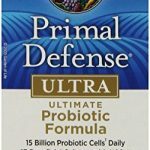 NOW Foods Probiotic with 10-25 Billion CFUs is an excellent choice for first-timers because the product has outstanding integrity while also being a broad-spectrum probiotic supplement- anyone can take it and benefit from it. Practically named after its culture count, the NOW Foods supplement contains 10 to 25 billion CFUs per serving, a number that has been tested and verified to be even slightly higher than that number. Not only is each capsule packed with over 27 billion CFUs, but NOW Foods also makes one of the highest retention-rate of live cultures at the end of its shelf-life. Because of the high CFU count, one capsule is sufficient to maintain and improve gut health, however two capsules are also safe to take for those in need of extra relief. NOW Foods’ Probiotic-10 25 Billion has 10 different probiotic strains including Bifidobacterium, Lactobacillus, and Streptococcus strains. These are strains that should exist in abundance in a healthy gut environment. This supplement has also been tested for purity and its strain content has been verified as free of Soil Based Organisms (SBOs), active yeasts, or other filler substances. Probiotics-10 25 Billion is also a vegan product that can be safely consumed by people with lactose intolerance, gluten allergies, or low-tolerance for salt, starch, wheat, soy, shellfish, or preservatives. While NOW Foods’ line of probiotic supplements passes all the tests for potency and CFO count retention throughout its shelf-life, some have complained about the capsule not being coated by an enteric layer. This leaves the product vulnerable to stomach acids, which can compromise the delivery of viable probiotics. That being said, NOW probiotics contains an average of 27 billion CFOs in one serving while the average person requires less than half of that to maintain gut health. Since these are not enteric-coated probiotic supplements, potency should be preserved through refrigeration. This is one of the highest-rating probiotics for retention rate of viable live cultures at the date of expiration. NOW Foods Probiotic-10 25 billion has a guaranteed shelf-life of two years if kept refrigerated. 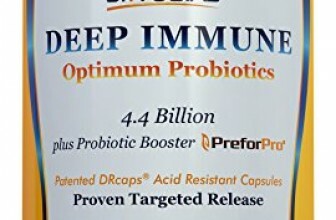 An all-around great probiotic product, this is a supplement that works well for anyone with minor digestion problems or an interest in improving and maintaining gut health. The supplement is very pure and has been tested for product integrity and validated for its report of viable CFOs at the time of expiration. That being said effectiveness and potency could suffer if the product is not refrigerated and/or you take a capsule on a full stomach. These are not enteric-coated tablets, so they do not have stomach acid resistance.